Keep Insulation AWAY from HOT Recessed Cans!!! According to the Department of Energy, a home loses costly heat and cooling through ceiling openings for recessed lights. 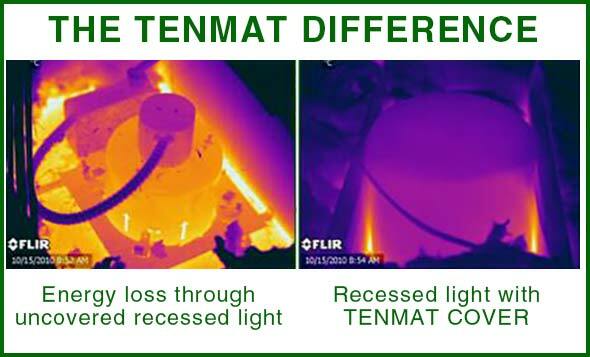 To solve this issue TENMAT, the manufacturer of the only flexible UL Fire Rated Light Cover, introduces the FF Recessed Light Protection Cover Series. The TENMAT enclosures are fire resistant covers that seal the opening and protect your light fixture from insulation in the attic. By stopping heat and air conditioning from escaping and restricting cold air from coming inside, the draft stop covers will help to significantly reduce your energy bill and carbon footprint. TENMAT insulation protection covers are the only flexible recessed light enclosures that have been specifically designed to keep insulation away from recessed lights in attics and roof/ceiling designs. The covers maintain sufficient space around the fixture for proper functionality when surrounded by sprayed foam, mineral wool, fiber glass and blown-in cellulose. The dome-shaped barriers are made of durable, thermal insulating mineral wool, and arrive fully assembled to be installed within seconds. Simply put the flexible and lightweight covers on top of your light fixture – Done Deal! Most recessed lights are not compatible with insulation and oftentimes start cycling on/off after they have been buried with cellulose, foam, fiberglass, etc. The lights’ malfunction is a concern and a safety hazard. Pushing the insulation away is not an effective solution since it creates air passages in the building envelope and wastes energy. TENMAT Recessed Light Protection Covers are fire safe enclosures that were specifically designed to protect your light fixture from insulation in the attic and to keep combustible materials, such as blown-in cellulose, to come in contact with the hot light. TENMAT Recessed Light Protection Covers are fire tested in accordance with IEC 60598-1, as well as thermally tested according to UL 1598 for usage with IC and Non-IC rated lights, as well as incandescent, fluorescent and LED retrofit light bulbs. TENMAT covers are made out of a non-combustible mineral wool material and are compatible with sprayed foam insulation, blown-in insulation, low-density foam, lay-in insulation, mineral wool, fiber glass, and blown-in cellulose. Due to the improved airtightness and insulation, TENMAT users experience significant energy savings. TENMAT Recessed Light Covers allow the insulation to be continuous and uninterrupted over the whole area of the ceiling, therefore saving energy and carbon emissions. Airtightness tests conducted by Chiltern Dynamics confirmed that TENMAT covers reduce air leakage up to 94%, which translates into annual energy savings of over $30 per fixture. Fast and reliable delivery to anywhere in the US and Canada. TENMAT Recessed Light Protection covers are usually in stock and ready for immediate shipping within 24 hours of order placement (excluding weekends and holidays). Are your light fixtures installed to the latest fire safety standards?